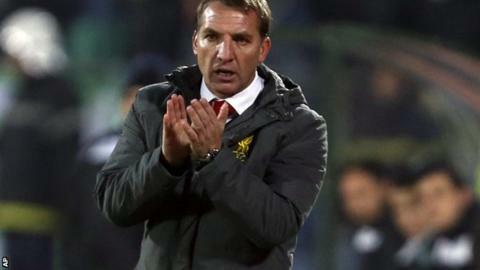 Liverpool manager Brendan Rodgers says he is "favourite for the sack" after the Reds' poor run of form. Having picked up only one point from their last four games, Liverpool sit 12th in the Premier League, 18 points behind leaders Chelsea. "A few months ago I was the manager of the year, now I'm favourite to get the sack," said Rodgers, who is actually third-favourite with most bookmakers. "It's part and parcel of this wonderful life of working in football." Liverpool have already lost six games in the league this season - as many as they did in the whole of last season - but Wednesday's 2-2 draw with Ludogorets Razgrad at least ensured the Reds can qualify for the last 16 of the Champions League if they beat Basel in their final match. "All you can do is focus on the immediate job, on what you can control," added Rodgers. "For me, it's about working with the players, providing even more clarity in their roles and the function of the team." The former Swansea boss also defended goalkeeper Simon Mignolet, who has come in for criticism from ex-Liverpool keeper Bruce Grobbelaar. "He's saved us in a number of games," said Rodgers. "His form is just like the team. We all need to be better. "Simon is fine, I had a good chat with him today. It's never easy taking criticism, whether it's deserved or not. But, it's part of the sport."